Monotype’s successful and widely acclaimed Pencil to Pixel type exhibition arrives in New York City this weekend, and we’re gatecrashing. Showcasing a heap of typographic treasures, this is an event you don’t want to miss! We’re surrounded by type from dawn till dusk, but it’s not often that you get the chance to see the history of the typefaces that shape our environment. Only a handful of people can say they’ve been within touching distance of the original drawings of design’s classic typefaces, and this is your chance to join those lucky few. The Pencil to Pixel exhibit runs from 3–9 May at the Tribeca Skyline Studios in lower Manhattan, and curators have delved deep into Monotype’s vault to unveil typographic artefacts that span its 125 years in the field. 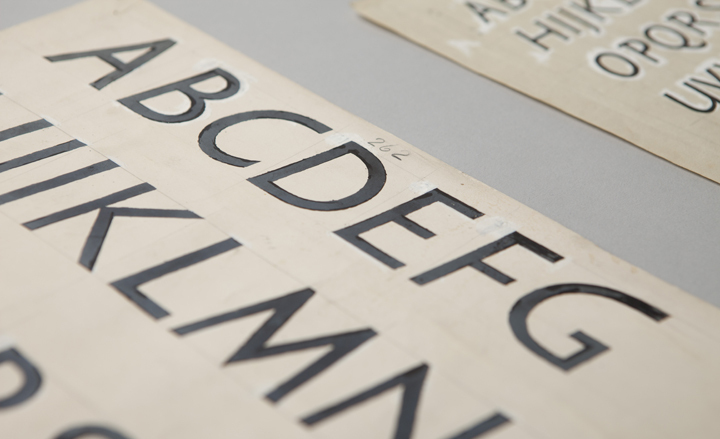 You’ll be able to get up close to original artwork, examples of precision drafting, metal and film masters, historical photographs of their type designers at work, and the tools used to bring typefaces to life. It’s a rare chance to learn about the birth of some of your favorite typefaces, follow type’s trajectory from inspiration to execution, and better appreciate the thought, care, and design craftsmanship that has gone into the typefaces we work with daily. the manuscript that inspired Adrian Frutiger’s typeface Linotype Didot. They’ve also added some special items of American type heritage, including a copy of the 1931 Linotype magazine Typographic Sanity (which was published in Brooklyn) as well as original drawings of the Centaur typeface by American typographer and type designer Bruce Rogers. Over in the pixel portion of the exhibit you’ll find us joining in the fun. David and Paul, our designer and director, will be there all week with our mini device lab to help celebrate web typography and show visitors how easy it is now to display beautiful type on modern devices. So make sure to say hello. Grab the controls yourself and see firsthand how classics like the Gill Sans and Helvetica typefaces translate to different platforms and operating systems. Admission is free and they’re even providing free guided tours, but you have to reserve a ticket. So grab some friends, book your tickets and make an afternoon of it. We hope to see you there! Follow Pencil to Pixel on Twitter and join the conversation using #penciltopixel. You can also follow all the chat and the stream of live pics from attendees at their hashtag feed.